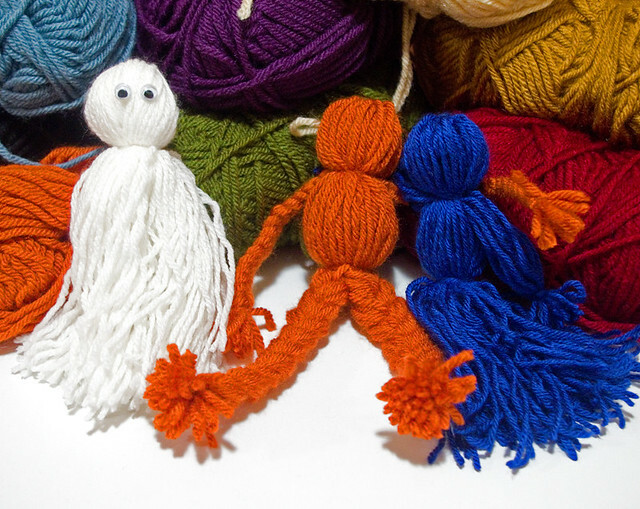 Yarn dolls are something that I used to make all the time as a kid; once again, I believe I learned how to make them in Girl Guides. 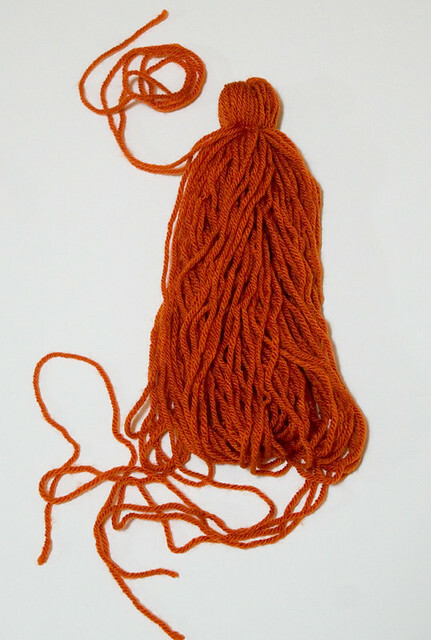 I realized that I hadn’t made any with my own children yet when Thing 1 came home from Guides the other night with the beginnings of her own yarn doll in the works. Thing 2 hadn’t had a chance to make them yet, so I thought I’d dig out my solid-colour yarns left over from previous projects and let them get at creating. If you’re not the kind of person who’d have yarn scraps around the house, don’t despair! There are lots of very cheap yarns available, even from the dollar store. But before you head there I might recommend hitting the local thrift shop. 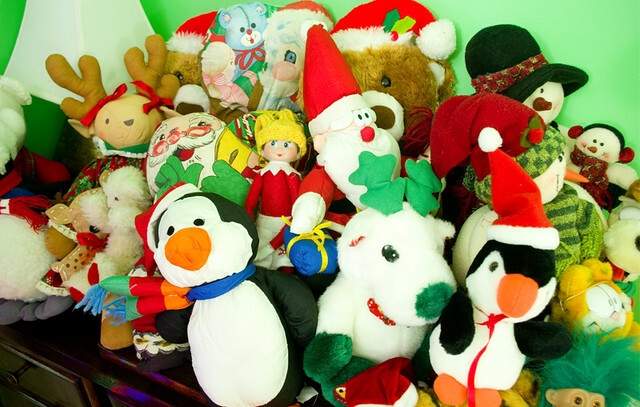 There you can usually find orphaned balls of yarn for a fraction of the price of buying new, and it keeps a previously-loved item from going to a landfill. – OPTIONAL: googly eyes, beads, buttons, scrap fabric, etc. 1. Get your yarn, book, and a pair of scissors. I chose a stack of file folders for 8″x10″ pages because they were about the right size for the size of doll that I wanted to make. However, you can really use any size of book or even a piece of cardboard. 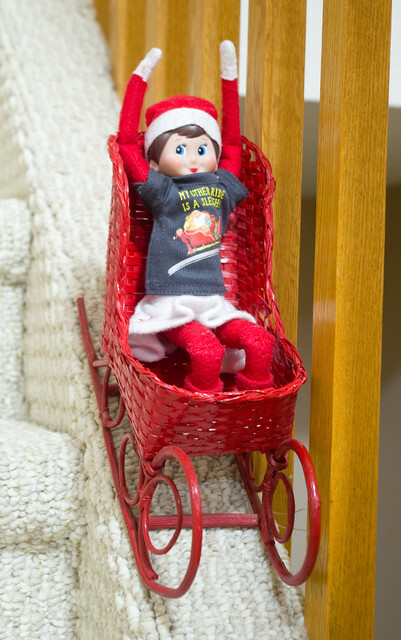 Since it’s just going to hold the yarn, you don’t have to worry about damaging it. 2. 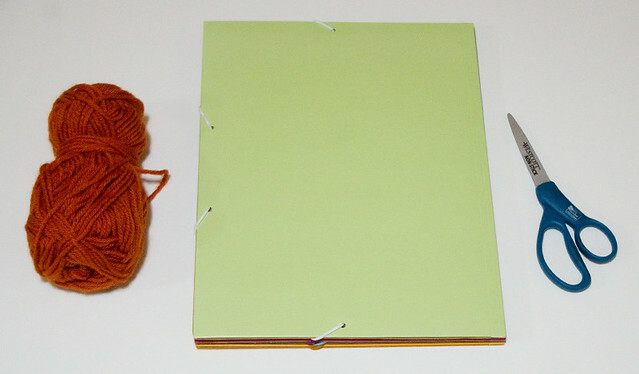 Wrap the yarn around the book until you have created a thick hank. 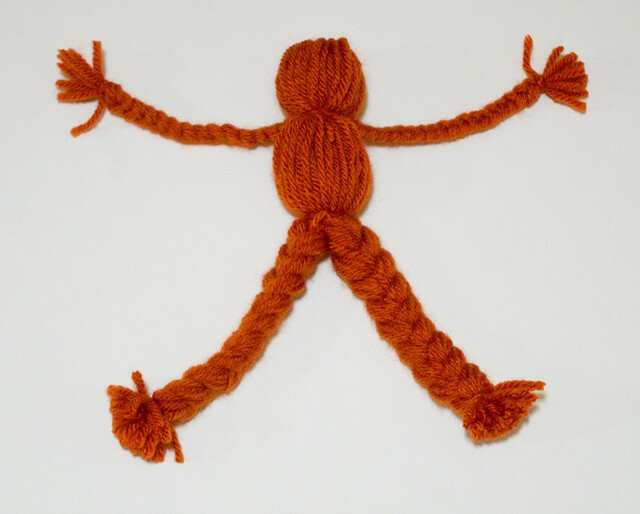 How much yarn you use depends entirely on how big you want the doll to be and what size of book you use. Feel free to experiment! There really isn’t any “right way” to do it. Then cut the yarn off of the ball. 3. 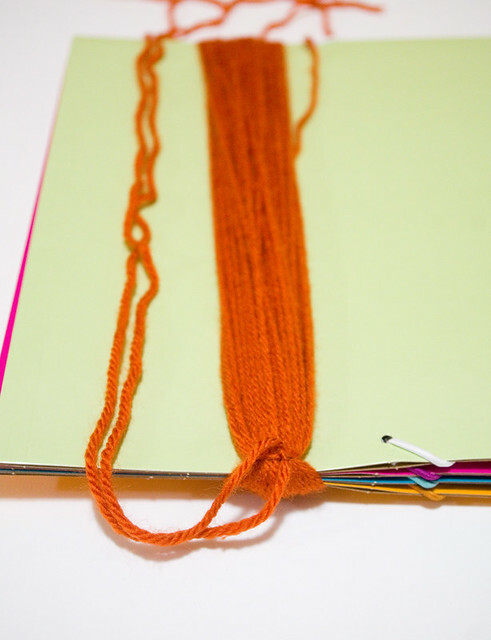 Cut a piece of yarn that is a little bit more than twice as long as the book. 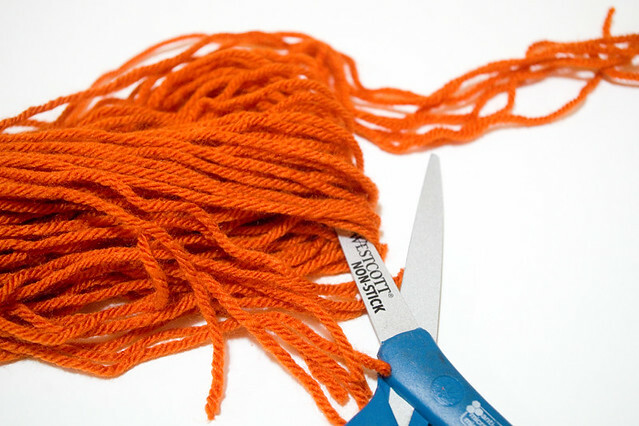 Thread the piece of yarn under the hank and tie it tightly with a double knot. 4. Slide the hank off of the book. Pass the piece of yarn that you used in step 3 through the center of the hank again and tie another double knot for reinforcement. Turn the hank inside-out so that the knots are on the inside. Smooth the piece of yarn so that it is now part of the hank. 5. Cut another piece of yarn that is a little bit more than twice as long as the book. 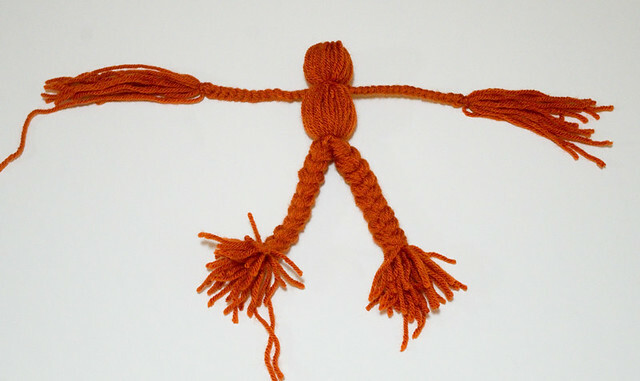 Wrap this yarn tightly around where you will want the neck of the doll to be, then tie it tightly with a double knot. 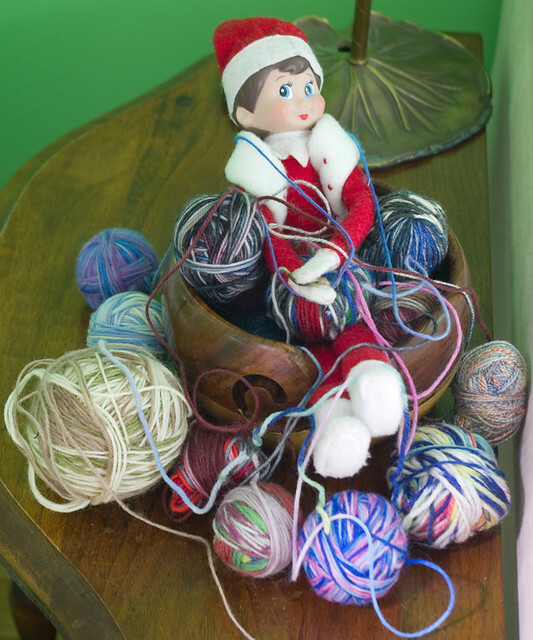 Wrap the yarn around one more time and tie it again for reinforcement. Smooth the yarn into the hank. 6. Holding the yarn taut, snip the loops at the bottom of the hank (opposite from the head you have created). 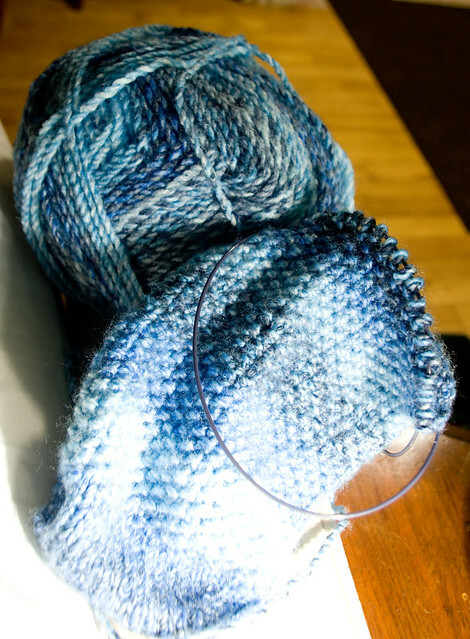 Trim the excess yarn so that it is roughly the same length. 7. Separate roughly a third of the yarn to create the arms (1/6 of the yarn per arm). For thicker arms, separate a little bit more. 8. 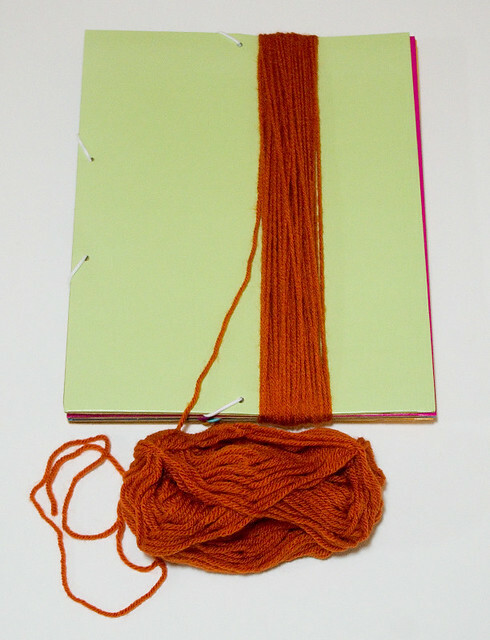 Cut another piece of yarn that is a little bit more than twice as long as the book. 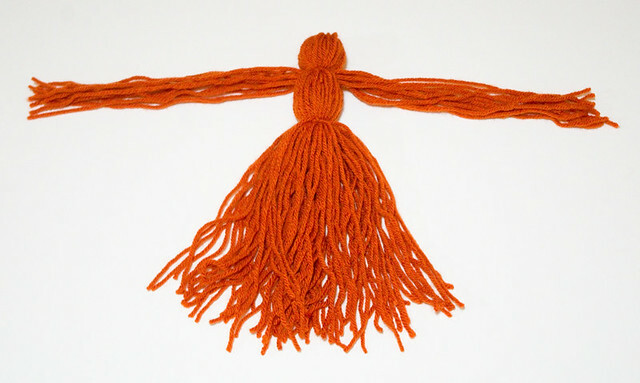 Tie that yarn to create the waist, using the same technique as at the neck. 9. 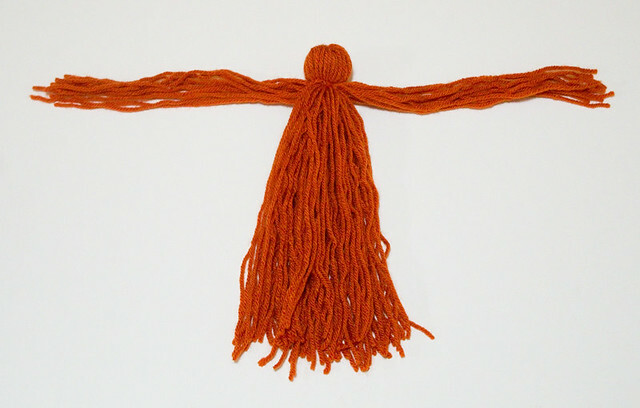 Braid the arms, double-tying the wrists tightly with scraps of yarn. 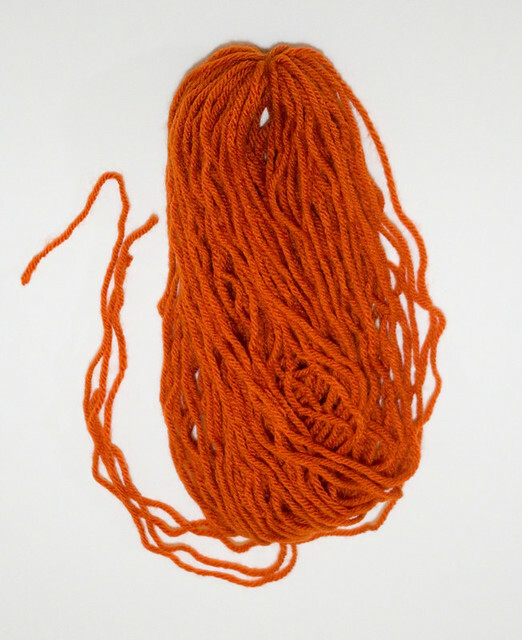 Divide the bottom of section of yarn in half and braid it to create the legs. Double-tie the yarn tightly around the ankles. 10. Trim off the excess yarn on the hands and feet. 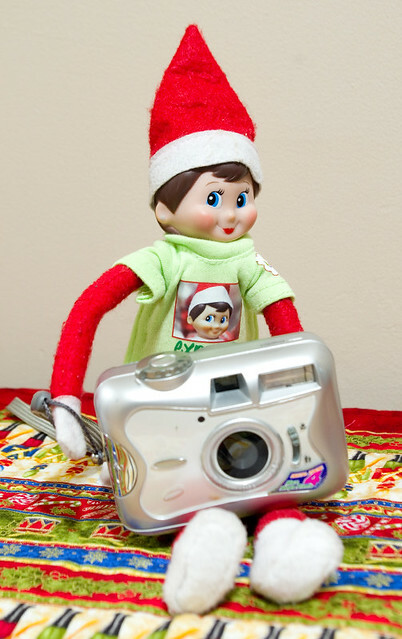 There are a couple of basic variations on this kind of doll that are useful to know. The first is the “dress” version, which basically omits braiding the legs to create a skirt. 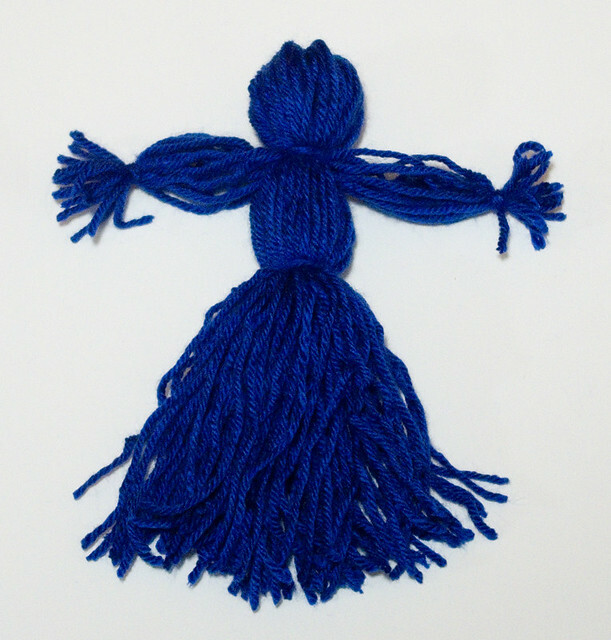 You may note that the arms of this doll are tied instead of braided, which is a much quicker way to do it; this is great for younger children who may have limited patience or braiding skill. It should be noted that this version requires a shorter length of yarn (i.e. a smaller book) due to the lack of braiding. Also, for a simple snowman, use white yarn and tie it all together at the bottom to create a “snowball” instead of legs. 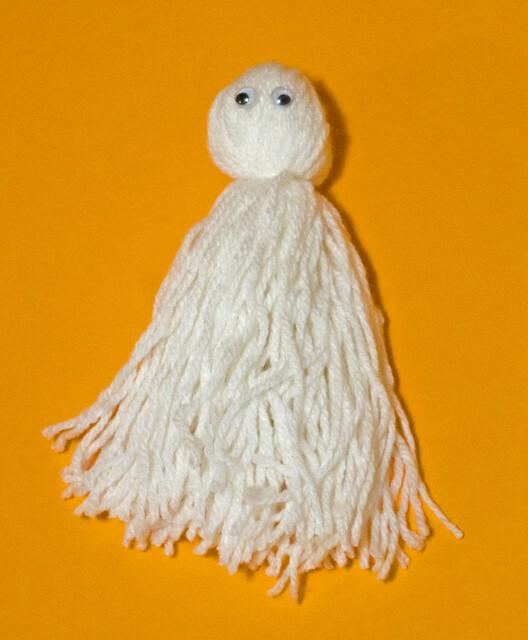 A great Halloween version of a yarn doll stops at Step 6, and requires only the addition of googly eyes to become a ghost. This is probably the simplest version possible, which is perfect if you want to make a bunch of them and hang them as decorations. I am loving working on my sweater of many colours, but it has become just a little bit too large to comfortably carry around in my purse. I mean, I could always buy a larger purse, but I am generally most comfortable with one that fits my wallet, cell phone, a paperback novel, and a small knitting project. The last time I carried around a Mary Poppins-sized bag was back when the kids were really little and I always had to have diapers, extra onesies, blankets, and bottles on hand. I’m really glad to be past that stage, to tell you the honest truth. But if I was leaving the sweater at home, I needed another, more portable project to occupy my hands during downtime. (I know that I can always read, but I can actually now read and knit at the same time, so long as the pattern is simple and I don’t have to hold a physical book open.) So I dug around in my stash for a ball of sock yarn that I bought before Christmas so that I could get started on gifts for next year — or maybe something for myself for a change? Who knows, it’s usually far in advance for me. I bought the yarn during the Christmas stocking rush and I knew I’d drive myself crazy trying to complete yet another pair of socks in time for the holiday, so I didn’t even try. I’m really liking how it’s coming together now, though. The self-striping pattern is really cute and the yarn itself is actually quite soft (75% superwash wool, 25% polyamide). The yarn is Flotte Socke 4f Christmas by Rellana Garne in color 2401. One way or another, even if I knit the sweater at home and the socks on the go, these Christmas socks should be done in time for the holidays. If it sounds a bit like I’m trying to justify starting a second project while the first isn’t complete, honestly, that’s exactly what’s happening. I learned a long time ago that if I have too many projects on the go at once, I end up finishing nothing! I try very hard to limit myself to one type of project at a time, i.e. one knitting, one sewing, one costume (except during final con crunch), etc. 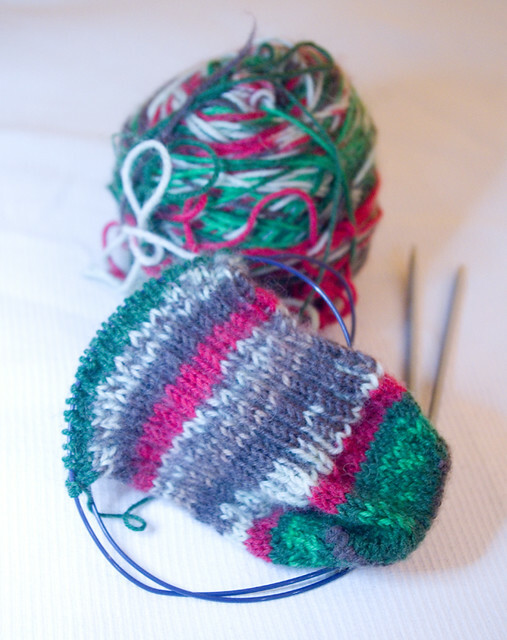 Working on this pair of socks seems like I’m breaking a rule somehow. Best wishes to all of you as you begin this very blustery new year. 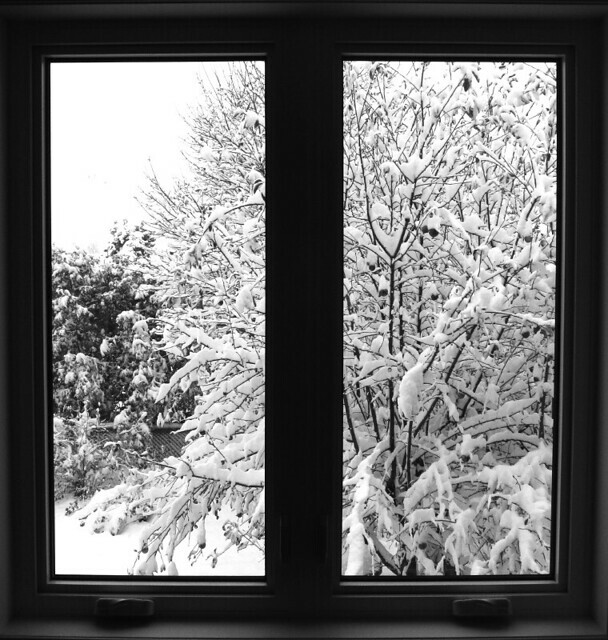 May your home shelter you and keep you warm, may your body and mind be healthy, and may your heart be happy throughout the year to come. Yesterday I hosted Christmas breakfast at our house, which is generally a cold meal with a lot of selection. There were a variety of cheeses (including two kinds of Balderson cheddar, a couple that were actually lactose free, and a spreadable goat cheese), smoked salmon, crackers, Nan’s pan rolls, mini banana muffins, Cookie Monster’s Famous Cookies, cold cuts, an assortment of crackers, and Little Shop of Lobsters’ crab and lobster mousses. To drink there was milk or juice, or the more festive apple cider or eggnog. This meal is generally served buffet-style, everyone munching away while we open gifts in the living room beside the Christmas tree. This meal represents the last of my cooking for about a week, since I’ve gone into overdrive to get everything ready — not just for breakfast, but for my contributions to Christmas Eve dinner, Christmas dinner, festive baking, and Christmas parties the week before. This spread isn’t just meant to feed us for the day; the leftovers will become meals in their own right for the week to come, so we can all relax a bit and play with our new toys. Yesterday was a very busy day filled with Christmas visits, Christmas shopping with a good friend, and knitting (I’m finally on Stocking #3). All that didn’t leave me with much time to cook, but I didn’t want to eat out, so I compromised with some quick fixes from the grocery store. That’s pork schnitzel from the butcher section; I’ve had schnitzel before, even had it in Germany, but I’ve never had the pre-made pork version from the grocery store. I didn’t have high hopes, but it wasn’t half bad! 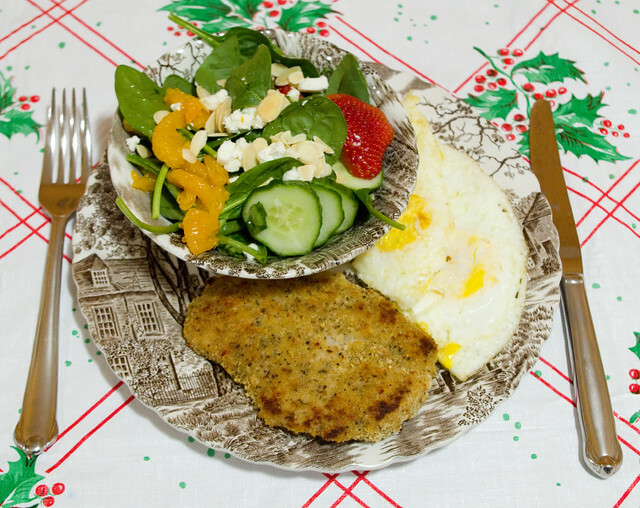 In an effort to keep in quick and simple, I served it with eggs over easy and a prepackaged spinach salad with clementine wedges, strawberries, cucumber, goat cheese crumbles, and sliced almonds. Overall, it was quicker than ordering takeout, and also both cheaper and healthier! While I’m still spending most of my time trying to finish up the Christmas knitting, we still have to eat! 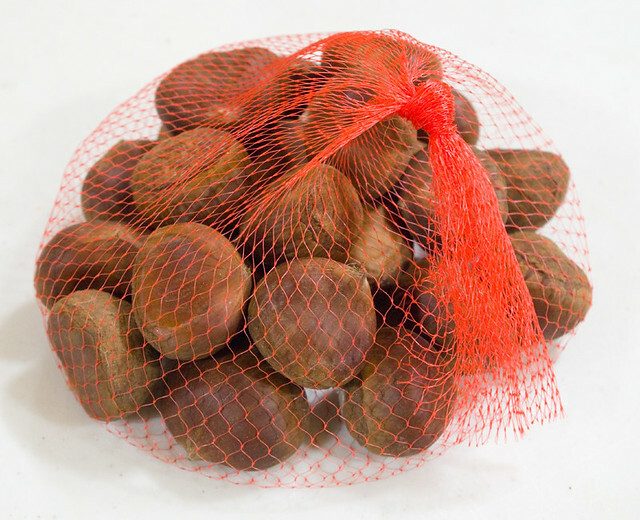 On a recent grocery store expedition, Thing 1 insisted that we purchase some chestnuts to roast at home — then promptly forgot about them. So I figured I should do something about that. Now, around here we tend to think of roasted chestnuts as kind of quaint and old-timey, mostly because of the Christmas carol. But when I was in Istanbul some years ago, fresh-roasted chestnuts were sold on every second corner in the old city, alongside roasted corn on the cob and stacks of chewy pretzels. One of my big regrets is that I never tried any while I was there, despite their tantalizing aroma! 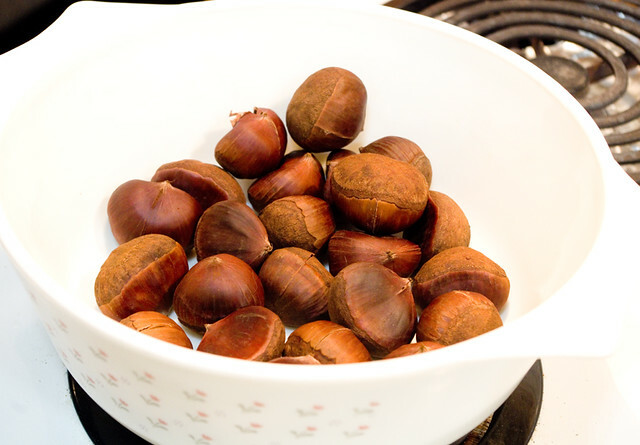 So I Googled how to roast chestnuts in the oven, and while everyone seemed to have a slightly different take, all of the methods seemed pretty simple. I more or less used the Howcast method. 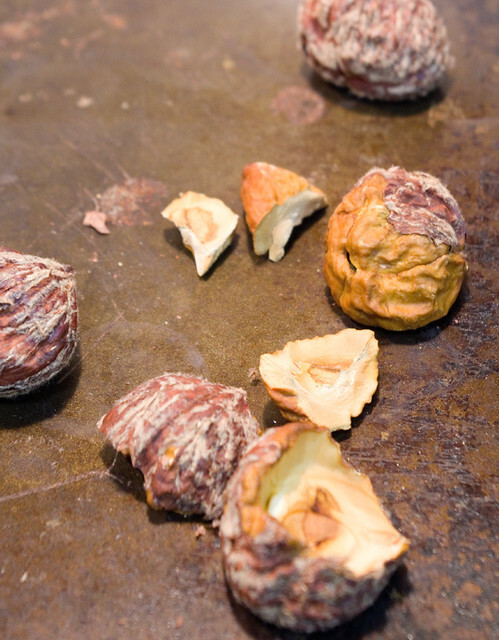 Basically, I preheated the oven to 375°F, rinsed and dried the chestnuts, and tried to make an X incision on the skin of the nut. It was here that I started to realize that things may not be going to according to plan, since if I’d used anything smaller than a butcher’s knife I would have snapped the blade. Then I baked the chestnuts in the oven on a cookie sheet, and followed that by taking them out of the oven and putting them in a casserole dish, which I covered with a towel and let rest for ten minutes. At this point I was pretty sure that there was something not working, since the BBC says the skins should open and the insides should be tender — and the skins remained defiantly closed. When I tried to peel them, my suspicions were confirmed. The shells were hard and the nutmeat was even harder; an experimental taste test threatened to chip a tooth. They were hard as a rock. So either I got the wrong kind of chestnut for roasting (and in my inexperience I don’t know the difference), or the ones I bought were ridiculously old and dried out. 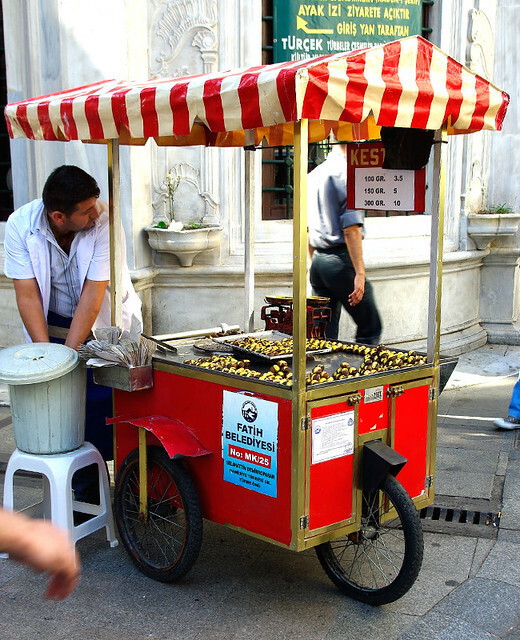 I’d like to try this again, because I still regret not eating the ones in Istanbul, but where can I be sure to buy the right kind and age of chestnuts around here? I have to admit that I’m feeling a bit like how Candy Cane looks at the moment. I’m in the knitting weeds, as it were. 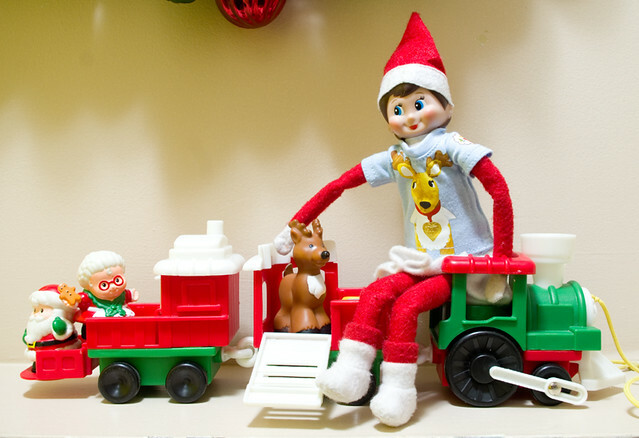 There are 12 days left until Christmas and I’m only halfway through the second stocking. Granted, most of my holiday shopping and other making is already complete, which is what has been eating into my time, but I was hoping to finish all four stockings in time for Christmas Eve. And much as I love knitting, I’m no speedster like the Yarn Harlot, although I don’t think I have her level of experience either.